This past Christmas our friend Jack gave us a bottle of his homemade raspberry peach pineapple freezer jam as a gift. It was so delicious that I ate most of it in one sitting. 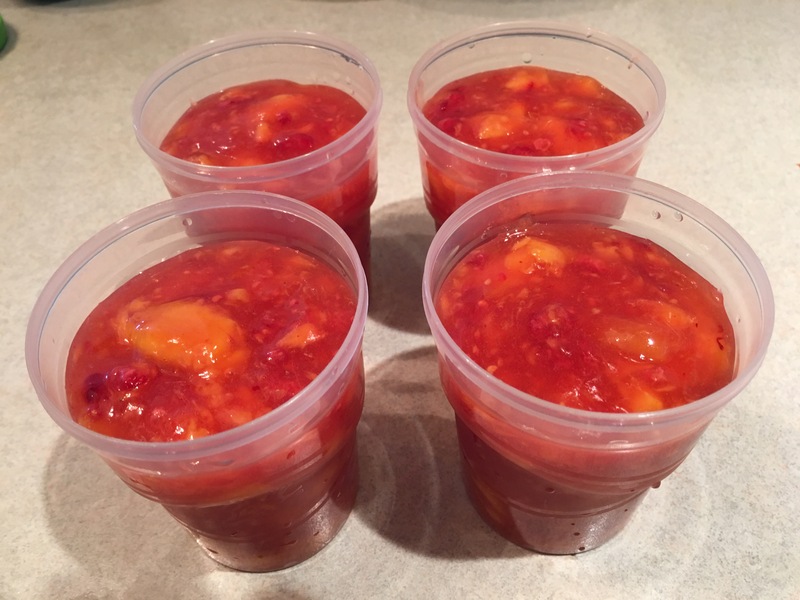 He shared the recipe and I have been looking forward to the local summer fruit to try a similar version. The recipe uses Cornaby’s Ultra Gel instant modified food starch as the thickener. It is a local product that is also available online. I made this version with local peaches along with plums and raspberries from our garden. Be sure to use ripe fruit for the best flavor and texture. In a large bowl combine fruit. Use a potato masher to crush the fruit. Add sugar and lemon juice. Stir to combine and dissolve the sugar. Slowly whisk in the Ultra Gel, stirring constantly to prevent lumps. Let sit 5 minutes to thicken, then stir to mix well. Pour into 4 cleaned and sterilized 8 oz. jars. Wipe the rims with a damp paper towel. Screw on lids. Freeze. Makes 4 cups freezer jam.